Lately it's been getting harder and harder to do much art and craft during the day. Lucius doesn't nap anymore and wants constant attention. Aymeric just wants to be held and cuddled a lot. I'm trying my best to be present for them and do what I can at night after they go to bed. I know they are only little once and before you know it, they don't want anymore snuggles from me. Lucius has been wanting to play with playdough all the time. 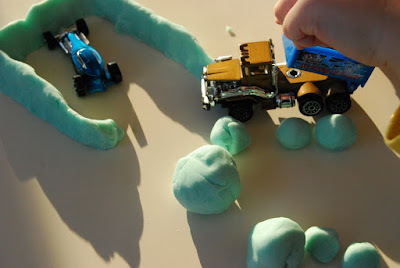 He loves running his cars in the playdough. I had a couple of mini tubs of Play-Doh around the house, but after a few times playing with them they dried out. As I was looking through my recipe drawer, I came across this playdough recipe in Darcy's family recipe book. The dough is so soft and it's lasting forever. Thought I needed to share! Add ingredients together in a pot and heat on medium heat until thickened. (You might need to sprinkle a bit of extra flour to form a ball). Take the ball out of the pot and knead for 4 minutes. Keep it in a Ziploc bag and the dough will last moist for months! Mass produce it and let's beat playdough off the market! Build it and they will come!